Fellow crafters you know it too well: coming up with a new product involves a prototype phase. Which is a glorious mix of planning and talent and chance. By documenting integrally the process, designers/makers can save a lot of time and some of their sanity (for those of us who have any left). Prototype. Sometimes it is the short and polite name for “try a bit of this and then a bit of that and then try again until you get it bloody right”. This can be a painful process but by some kind of magic all frustration disappears once we’ve reached the end of it. It sounds pretty much like giving birth if you ask me. Keep all original art and drawings. Yes, even the ugly ones. There may be something here, even something tiny, that you may need to go back to at a later stage. Time stamp everything. So you know when you first worked on something. And you know which version predates which. On top of the date you can add a version number or sizing information (S/M/L, 100%/150%/180%) if applicable. It could save you much recalculating in the future. Take notes on the making process as you build your prototype. Keep track of how you did what and in which order. Update the document as the process changes. So when time comes to make another one you won’t waste time guessing what the next step is. Be as exhaustive and detailed as possible. Document colour codes, tool sizes, material references, etc. The idea is to not have to check supplies and tools again and again to figure out what to use. Store it all at the same place. 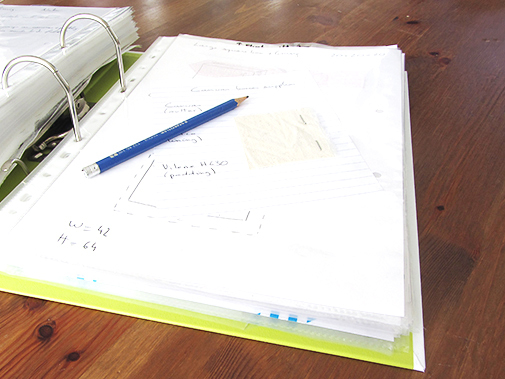 A good storage option are transparent pockets gathered in one big binder. Use a system that makes sense to you: should it be ordered by type of product, by name, by size, by colour, etc.? Next time you reach for your prototype binder you can pat yourself on the back. You’ve just avoided some nasty time wasting and trouble. And if you have any more prototyping documentation tips, please feel free to share in the comments below.